If you haven’t seen PASSENGERS yet or heard about the major plot point that is conveniently missing from the trailer, you may want to stop reading this review right now because I’m going to have to reveal what it is in order to properly discuss the film. Ready? This is your last chance. It’s sometime in the future and 5,000 passengers and 250 crew are on board the spaceship Avalon that is flying toward Homestead II, an Earth-like planet that the passengers will ultimately colonise. Because it takes 120 years to get there, everyone is put in suspended animation and the ship is on autopilot. All is calm as the ship hurtles through space until something goes wrong 30 years out and Jim Preston’s (Chris Pratt, GUARDIANS OF THE GALAXY) hibernation pod malfunctions, prematurely waking him up. There’s no one else on board for Jim to talk to except for Arthur (Michael Sheen, FROST/NIXON), the ship’s affable android bartender. He can’t signal for help because of the ship’s distance from Earth and he can’t reset his pod to put himself back to sleep. Needless to say, the realisation that he will live out his remaining years alone doesn’t sit well with Jim. Things start looking up for him, though, when he comes across the pod containing Aurora Lane (Jennifer Lawrence, JOY; AMERICAN HUSTLE). Immediately smitten, Jim turns to ship’s database to cyberstalk Aurora to learn more about her. After about a year of soul-searching, he makes the decision to tamper with her pod to wake her up. PASSENGERS could have been a great examination of societal ethics as both Aurora and the audience debate the merits of Jim’s decision. As Aurora correctly points out to Jim, by saving himself from a lifetime of loneliness, he has killed her. Unfortunately, after an all-too-brief look at the dilemma from her perspective, the script sadly veers clearly in his favour and very quickly both she and we are siding with Jim. This is no Sophie’s Choice where the title character struggles with the ramifications of her decision. Jim feels very little remorse or regret. The poor boy was lonely and that’s supposed to be sufficient grounds to justify his act. Even so, up to this point, PASSENGERS is still enjoyable viewing. Pratt and Lawrence are both engaging, Sheen is an absolute delight, and the ship, with its infinity pool and other STAR TREK-like amenities, is visually alluring. (No doubt, cruise ship and shopping mall designers will be taking note.) Unfortunately, this is where the story takes a sharp turn into the dumper. The ship has never been quite right since Jim woke up and “things” start happening as the various onboard computer systems fail and reboot with increasing frequency. 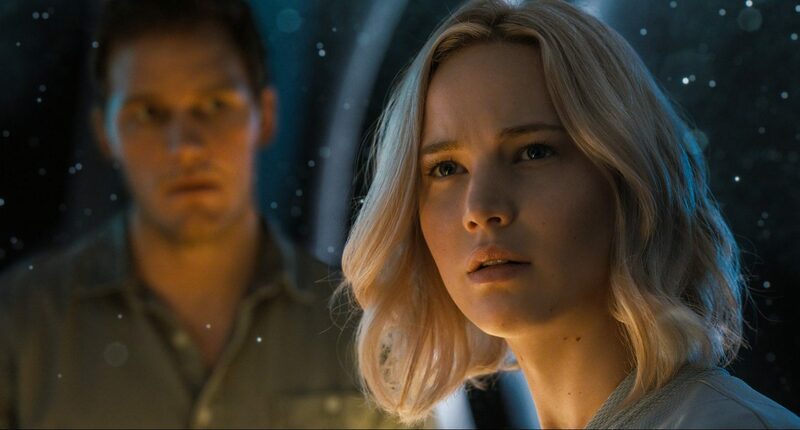 That’s when PASSENGERS moves from being a tale of “Adam and Eve in Outer Space” to one that is boringly reminiscent of THE MARTIAN or GRAVITY. As the ship heads towards a complete shutdown, all hell starts to break loose, and Aurora must find it in herself to forgive Jim in order to save themselves from a fiery demise. What a lost opportunity! This film could have really delved into the moral issues of taking a life to save a life but, sadly, it didn’t have the intestinal fortitude to go in that direction. Instead, we have a banal story of space heroics starring two highly photogenic actors. The screenplay was penned in 2007 by Jon Spaihts, who most recently saw success in DOCTOR STRANGE. It apparently sat in development hell for a few years as ownership changed hands, and various directors and actors came and went. Shame it didn’t stay there. PASSENGERS is an intergalactic disappointment. Watch the review on Facebook Live!